Here’s the thing: some of life is crazy-amazing; some of it’s hard, sad, and confusing; and some of it is just straight-up crazy. That’s why when you see magic happening, you need to call it what it is. When we planned the trip to Italy, we had no idea that our last night in Assisi coincided with Calendimaggio, the biggest festival of the year. The residents spend all year preparing for this four-day Medieval May Day festival, which is an elaborate, citywide reenactment of 13th Century life in Assisi — produced, directed and acted by residents, for residents. We knew something important was about to happen when wax-filled tin cans with enormous burlap wicks were placed outside our door earlier that morning. The city’s narrow water pipes were wrapped and tied with dried olive branches, and all street-level lighting was covered in dark cloth. Very mysterious — why the big effort? We went about our day of sightseeing and painting, but when we tried to return to the apartment in late afternoon, we were informed by the police that we couldn’t get back into our apartment for (4 fingers held up) hours, no matter how much we had to pee. 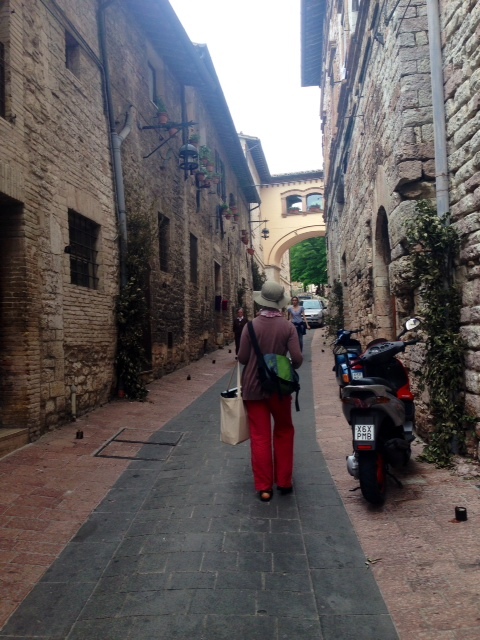 In just four days, we had come to know our neighborhood well enough to backtrack through the piazza and head up through another stone passageway. We carried our market bags up two hundred steps or so, through more cobblestone streets, past the Cathedral of San Ruffino, and down another few sets of stairs to reach our apartment. As we began packing up our bags for Rome, men appeared in the street outside our door to light the tin can luminaries. When we poked our heads outside, we were amazed to see that all of the city lights had been turned off, and every effort had been made to remove all signs of modern life. It was like we were living in a 13th Century town — the effect was incredible! Our narrow street was a flurry of activity: people rushed up and down the stairs dressed in Medieval costumes — from ragged-looking serfs to exquisitely dressed royals, barmaids, knights, and monks — all of them, very serious about their roles. Our street had been magically transformed into the backstage for the main attraction in the piazza below. We hadn’t bought tickets for the performance, so recognizing the opportunity for what it was, I made a big arugula and tomato salad, poured a glass of cold, dry white wine, and pulled a chair outside the apartment door to watch. For more than an hour, we watched the performers running up and down the torchlit stairs from the public stage below to a private stage in the walled garden above us. At one point, they must have been reenacting a brothel scene, and the glowing streets echoed with the sounds of the actors’ cries. In flickering light, we tiptoed up the steep cobblestone steps and through the narrow passageways, creeping quietly down dark alleys and peering into ancient, walled rose gardens. I felt five and five hundred; new and ancient, at once. As we made our way down the steps one last time, I gazed up at the starlit sky, marveling at this crazy-amazing life that offered us the gift to wander, unseen, through the streets of a medieval city on the first night of Calendimaggio. This entry was posted in Blog on May 9, 2015 by Leigh Hopkins. How lovely! I’ve missed your writing. What a wonderful trip. it’s always those unplanned moments that are so magnificent. Thank you, Kate – I missed it, too. These unplanned stories are exactly why I blog. I turned all the lights out and read this to my family …. There’s a thunderstorm brewing and everyone was attentive and wanted more! I WANT MORE!